The technique that I use when creating automata I call “freebuilding”. What this means is that I build from my brain through my hands, through materials and tools. Occasionally I’ll draw something before I create it. Occasionally I’ll create the same thing multiple times before I’m satisfied that I’ve got what I want. Some people work from plans…I work from my mind. On good days I’ve got my mind. I’ve now got most/all of the tools that I need. And I am building a stock of materials that is robust enough that many times I can go to my shelf and find what I need. In the beginning I had to scrounge around…take trips in the car…spend time online…etc. I’m talking about things like bushings and bearings and screws and nuts and bolts and plywood and shafts and magnets…I could go on and on. Having a stock of materials at my fingertips gives me a wonderful advantage. Many times I can “keep on trucking”, instead of being stopped because there is something that I need. Below is a list of some of the suppliers that I use. This list might be beneficial to those of you interested in creating your own automata. Note that I receive no consideration from suppliers so that they can be on this list. These guys are here because they’ve satisfied me. I’ve added most of these suppliers March-April 2019. Their stock is very deep. I can almost always find a solution to a situation on the McMaster website. Where I am located I receive delivery next day. 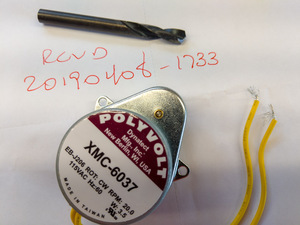 For example…I just ordered a gear motor and a 7mm drill bit. I’ll have them tomorrow mid afternoon. Sweet! Their website is the best ecommerce website I’ve ever used. The absolute best. Shipping is extremely reasonable. When you order from their website they don’t quote shipping. Instead they add shipping after the items have been packaged and weighed. The shipping charges are ALWAYS very reasonable. If you are old (like me) you may remember the bright yellow McMaster Carr catalog that large companies would have. The books were about 3″ thick and full of wonderful things. Now they’ve got a great website (and perhaps the books are still available). McMaster is not for those that seek discounts. McMaster is for those that seek quality solutions. Bottom line…I recommend McMaster-Carr . I received these two items 20 hours after I ordered them. McMaster Carr Rocks! When I first started creating automata I used the stocks of hardware that I had on hand. Over the months and years I’ve identified that working with screw sizes #2, #4, #6, and #8 are my preferred sizes…with #4 and #6 being used most often. #2 gets used a lot also…and #2 is fun to work with. In the beginning I worked with zinc plated steel, however I have settled on stainless steel 18-8 as my standard. I simply like the look and feel of the stainless a lot more than the zinc plated steel. And from the standpoint of longevity the stainless is the better choice. 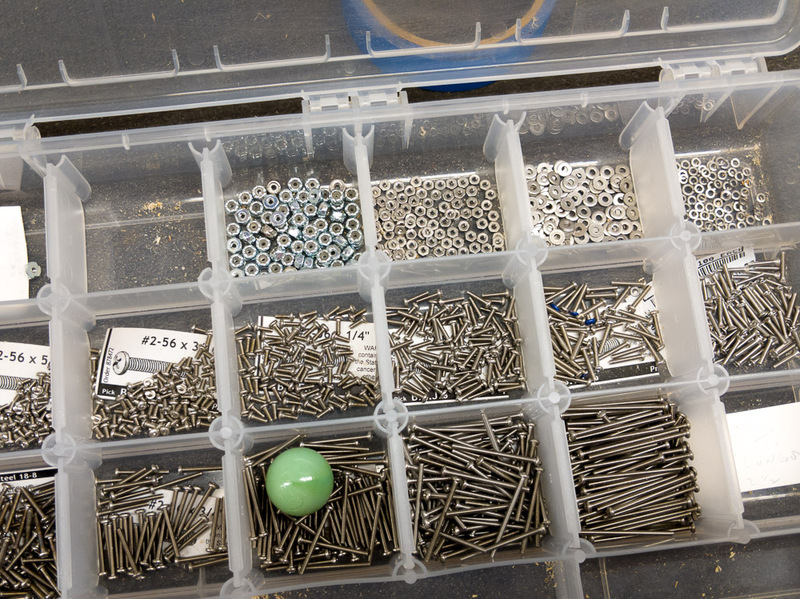 That said, I cannot always get what I need in stainless so my parts bins contain a mixture of zinc plated steel and stainless steel. The marble in there sort of like a bookmark. I was working with this size most recently…the marble helps me keep track of what I’m doing. My nuts and bolt supplier is The Bolt Depot. These folks are prompt, have fair pricing, ship quickly, and use USPS Priority Mail, which is quick and reliable. My screw of choice is the Phillips Pan Head. My favorite nut is the self locking kind with the nylon insert. I buy in packs of 100. It is wonderful having the right screw when you need it. 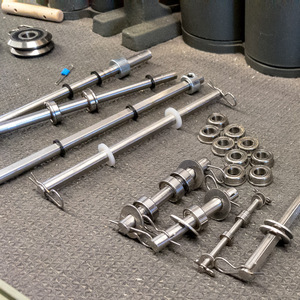 Bottom line…I recommend Bolt Depot . Most of my nuts and bolts come from The Bold Depot. I favor stainless steel. 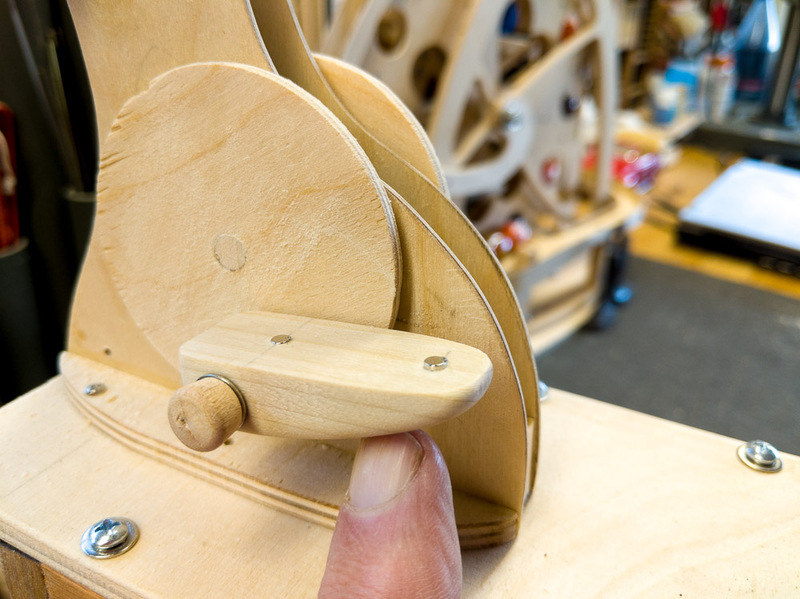 As I create automata I desire to create smooth operation, durability, and longevity. 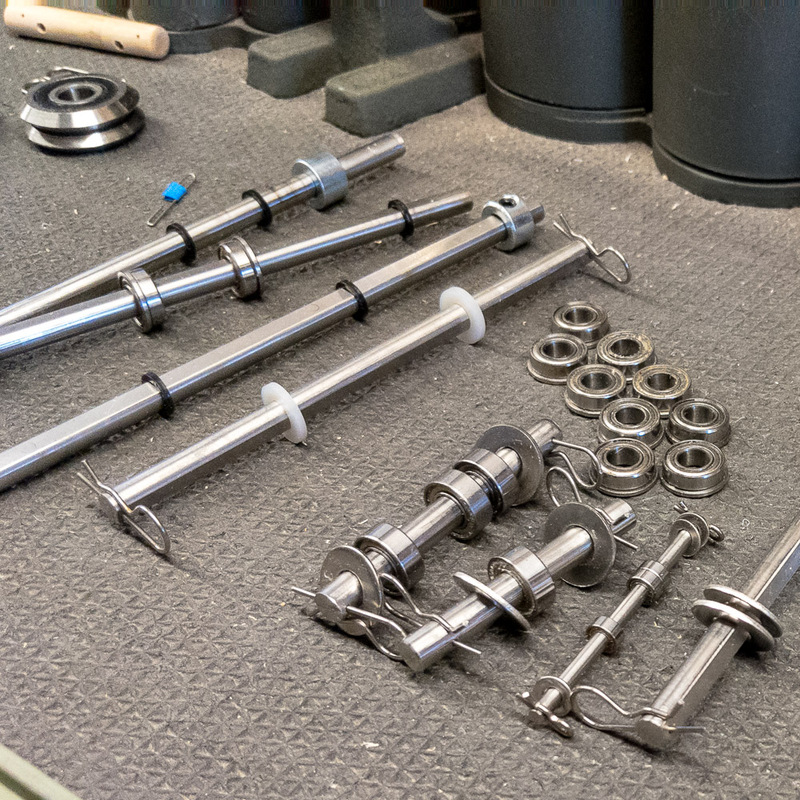 ServoCity is where I purchase most of my ball bearings, stainless steel precision shafts, nylon spacers, clamping hubs, collars, shaft spacers, linkages, gears, sprockets and chain, pulleys and belts. I work primarily with shaft diameters 1/8″, 3/16″, and 1/4″, thus I work with very small bushings and ball bearings. For example, the ball bearings for 1/8″ shaft are 1/4″ OD. I find the ServoCity prices to be reasonable. I think that one time something was backordered…but generally speaking they completely fill my orders. If I order in the evening I’ll usually wake up to an email thanking me for my order and telling me that it’s packaged and off to the carrier. And (please don’t tell my wife) they normally include some Tootsie Rolls or some such in each shipment. ServoCity is my primary supplier for this type of hardware. 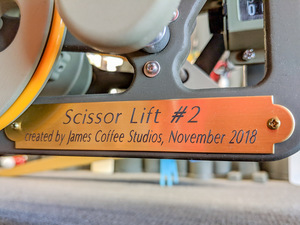 I’ve worked on and off with magnets for many decades. I enjoy integrating them into my automata. Sometimes they are used to simply hold things in place in a manner that permits easy removal. For example, my bipeds are all held in place with magnets. And sometimes the magnets have a job to do. For example on Big Wheel Lift I use magnetic assemblies as shock absorbers. You can watch a video here. Initially I had problems storing my stock of magnets. I have learned to keep them tame by using a metal candy box. 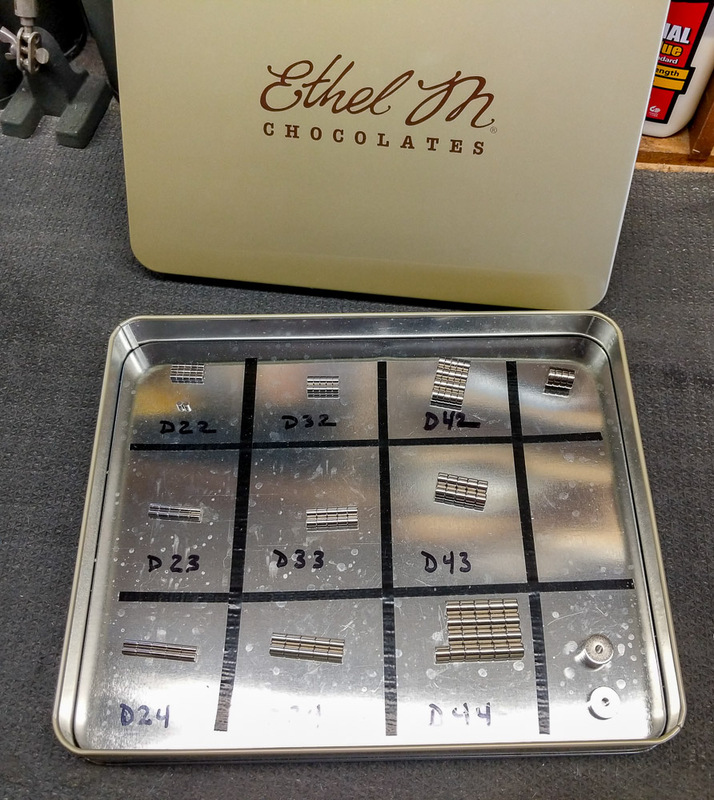 I work with cylindrical magnets, typically sized 1/8″ X 1/8″ (D22) through 1/4″ X 1/4″ (D44). My magnet provider is K&J Magnetics. They have a broad selection of magnets, reasonable prices, and they ship next day. I couldn’t ask for more. Bottom line…I feel a great attraction to K&J Magnetics. 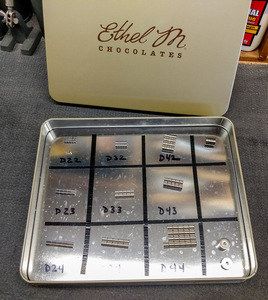 Magnets are conveniently stored in a metal candy box. One day I looked around and realized that I was working with 8 different thicknesses of Baltic Birch Plywood. 1/64″, 1/32″, 1/16″, 1/8″, 3/16″, 1/4″, 3/8″ and 1/2″. Most commonly I am working with 1/32″, 1/16″, 1/8″, 3/16″, and 1/4″. I can purchase the 1/8″ and the 1/4″ locally, but must source the rest on-line. Being the spreadsheet geek that I am I compared prices at about 4 different sources. National Balsa stood out as the one that had the most reasonable prices, AND that stocked all the sizes. They also sell Balsa, which I use in the armature of my bipeds. And just to finish the wood story let me say when I need hardwood I use Poplar, which is available at the local Home Depot. And if I want a decorative hardwood I either work from my stash of Myrtlewood, Pecan, Maple, or Redwood. And if nothing there ignites my fancy I go to either my local Rockler or to TH&H and browse through their selection of woods. 25 April 2019: I received my second order from National Balsa yesterday. Bottom line I am not pleased with either the product or the packing. The 3/16th sheets were cupped. The mill work looked like it had been done by someone that did not care and who was using dull equipment. And most annoying…the sheets were shipped in a box filled with loose styrofoam peanuts. It was like opening a box filled with wild cats. I’ll be searching for another supplier. Hopefully I’ve ordered for the last time from National Balsa. Too bad. It all could have been good. My primary building material is Baltic Birch Plywood. It may seem strange to you that I am listing a magazine on my Favored Suppliers page. Not strange to me though. Information is extremely important I need a good source of information and Automata Magazine seems to be able to fill part of that need. New, just getting started, still taking baby steps as I write this (8 April 2019, they have published just two issues) the Automata Magazine has just gone into subscription mode (as the way to monetize itself). I am subscribed and I have fingers crossed that Automata Magazine will find a solid base of subscribers and that it will be in existence for decades into the future. Information is a valuable commodity. Bottom line…I am pleased to recommend Automata Magazine. 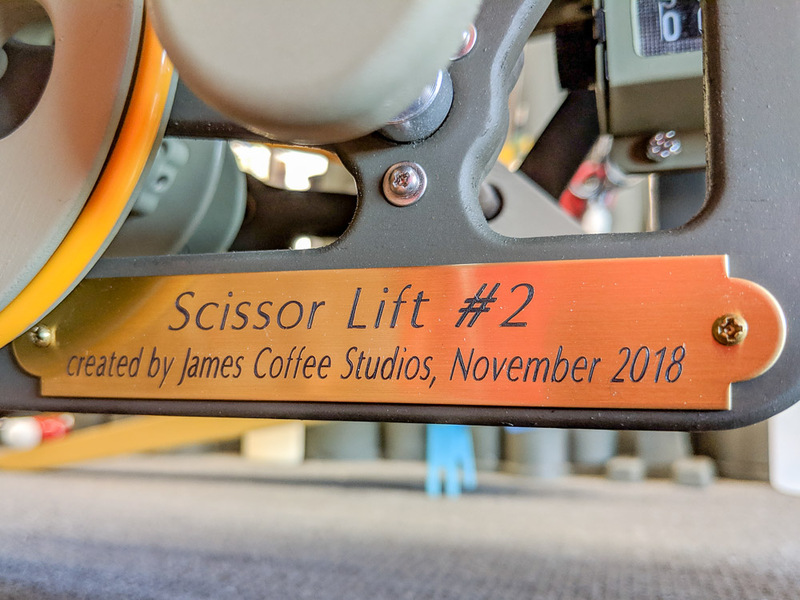 It is important to me that my automata operate smoothly and without a lot of friction. To this end I often use ball bearings. I order most of my ‘normal’ ball bearings from ServoCity (simply because I order more frequently from them). I occasionally use bearings that are more specialized and these bearings I order from VBX Ball Bearings. For example, I order bearings that have a V groove in them that I use for following cams. And I order one way bearings, and rubber tired bearings, and etc. VBX has a wide variety of bearings, at reasonable prices, and they ship quickly. Bottom line…I am pleased to recommend VXB Ball Bearings . I use this grooved ball bearing to follow a cam. The raw materials that I work with when I create my automata are important to me. I don’t like working with ‘inferior’ stuff. Dowels are an important component, and square dowels are extremely useful. I find the hardwood dowels and square dowels from Woodworks to be very desirable. I enjoy working with them. Woodworks stocks other items that I find use…for example pegs, knobs, pins, balls, wheels. These folks make a quality product and ship quickly. Their prices cannot be beat. Bottom line…I am pleased to recommend Woodworks Ltd.
It’s wonderful to have a supply of square dowels. I work with relatively small fasteners (though not small to a watchmaker). 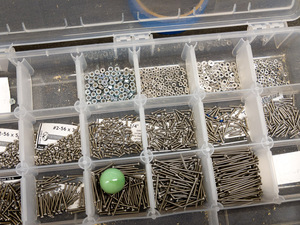 It’s difficult to find a supplier that stocks all the fasteners that I use. I don’t order a lot from Micro Fasteners but I do order things that are important to me and that I cannot conveniently get elsewhere. 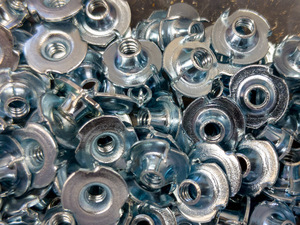 #2 and #4 T-Nuts are an example of what I’m able to purchase from Micro Fasteners. Reasonable prices. Very quick shipping. Bottom line…I am pleased to recommend Micro Fasteners. The automata that I create are designed and created to last for generations. I think that it is very proper to equip each with a nice name plate. US Brass does a first rate job. The brass and the engraving and the spray finish are top quality. But above and beyond…I mentioned a minor error to them that they had made. I did not request a replacement…and they replaced anyway. Wow…that was nice of them. Bottom line…I am pleased to recommend the US Brass Shop. As the past several years have passed I have debated with myself about whether or not to put motors in my automata. Initially I was against doing so. I like the feeling of cranking…the intimacy of the feel of the crank as it goes through it’s rotations. 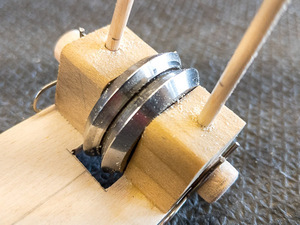 The connection to the automata that a crank provides. That said…I have received enough feedback from those that I respect to change my mind. I now design with the intent of using both a hand crank and a motor. I’ve purchased perhaps 6-10 motors over the past few years and have found the process to be sort of agonizing. I wasn’t sure what I was doing. I tried to get very good quality at reasonable prices. Over time I got a feel for what I need and when that happened I realized that I needed to find a source from which I could order the same thing again and again for decades. I think that I’ve found the solution in Chancs Motors. It’s true that I’ve only received one motor from them so I’ve not a lot of experience. None the less…I think I’ve finally got this problem solved. Bottom line…I am pleased to recommend Chancs Motors. 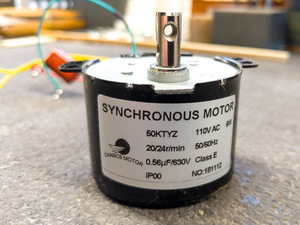 A 6 watt selectable CW CCW Motor from Chancs Motors.